Sustagen is a nutritious supplement that can help you meet the body's daily needs for macronutrients and essential vitamins and minerals. Sustagen is a nourishing drink that provides energy, protein, calcium and vitamin D.
Sustagen Diabetic Sustagen Diabetic is a Food for Special Medical Purposes specifically formulated for people with diabetes who cannot meet their nutritional needs through diet modification alone. 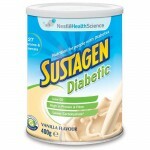 Sustagen Diabetic is a great tasting, nutritional supplement drink that has been designed specifically for people:with pre-diabetes or diabetes (type 1 or type 2) who are not eating wellhave a poor appetiteduring or recovering from illness.Sustagen Diabetic also provides essential nutrition without negatively impacting blood glucose levels.Must use under medical supervision.DirectionsMix 7 level of scoops with 210ml water or milk (depending on taste). 1 scoop of Sustagen Diabetic = approx 8g. Scoop included in can.Stir before serving. Served chilled or warm.Flavours: Vanilla ..
Sustagen Hospital Formula Active Plus FibreSustagen Hospital Formula plus Fibre has a lower GI making it an appropriate choice for people with Diabetes. Insoluble fibre helps with bowel regularityFibre helps you feel fuller longerSoluble fibre can help lower cholesterol absorptionAs always, use in consultation with a health care professional.DirectionsSustagen Hospital Formula plus Fibre is a great tasting liquid supplement, which can be mixed with water or milk.Mix 3 level scoops* with 200ml water or milk (depending on taste).Use enclosed scoop * 1 x scoop of Sustagen = 20g. Stir before serving. Served chilled or warm.All prepared product should be tightly covered and consumed within 6 hours at room temperature or within 24 hours if refrigerated.Recommended consumption 2 serves per day.Flavours: Chocolate or Vanilla..